Please join us at our Members’ Party! We are thrilled to host a fun party for our members and volunteers who contributed so much to the community this year. This is an opportunity to enjoy great local music, be inspired by our guests, and to meet lots of interesting people excited to build better bikeways, trails and walkable cities. Friday, January 30, 2015, 6:30-9:30 p.m.
Live music by the Buckhorn Mt. Stompers! Bryan Jones, Active Transportation Engineer. Both have extensive experience and inspiration to share with us about the biking and walking improvements transforming California cities and how we can do that here. Shasta Living Streets made major contributions to the community this past year and we look forward to making a greater difference in 2015 with your support! Read about it: 2015 – Let’s Get Started! Not a member yet? – No problem, it’s easy! Or become a member at the door. 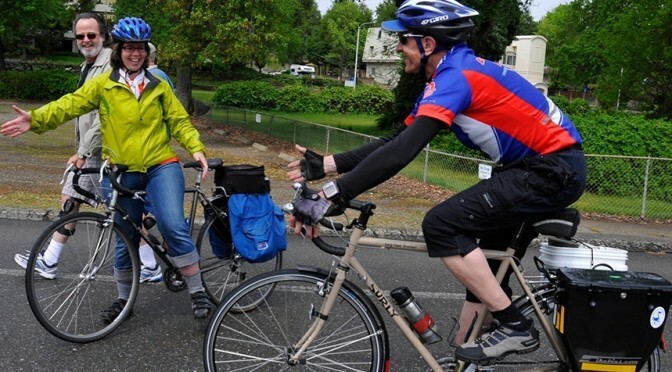 Your membership builds better bikeways, trails and walkable cities in our region. Join Us Saturday, April 22nd to celebrate healthy active living!